He has a fast stride and an easy laugh and he is delighted, just delighted, to find each new caterpillar and chrysalis and, there, look ... a Monarch butterfly alighting on one of thousands of popping pink zinnias cultivated across the property specifically to attract and feed the butterflies. His only groan comes when he tells me I’ve missed the roost by no more than an hour. “It’s too bad. Just too bad. If you had been here earlier you would have walked between the trees with monarchs flying all around you,” says Ivan McIlroy of Wallace Springs Eco Centre near Gowanstown. I discover I have Monarch envy as he describes how hundreds of Monarchs roost in the pines and willows in the front yard. We had chatted the day before and he said “come, they are still here.” But a north wind blew in overnight and it stirred the Monarchs’ migration instinct. By 8 a.m., most had left to fly up to 30 kilometres a day enroute to Mexico. I arrived just past nine. Still, it is hard not be delighted with all that is left to see. Huge patches of pink and orange Mexican sunflower (tithonia) and zinnias are feeding the stragglers while a later caterpillar chews on an old milkweed plant in one of the two pollinator patches the McIlroys plant for this very purpose. 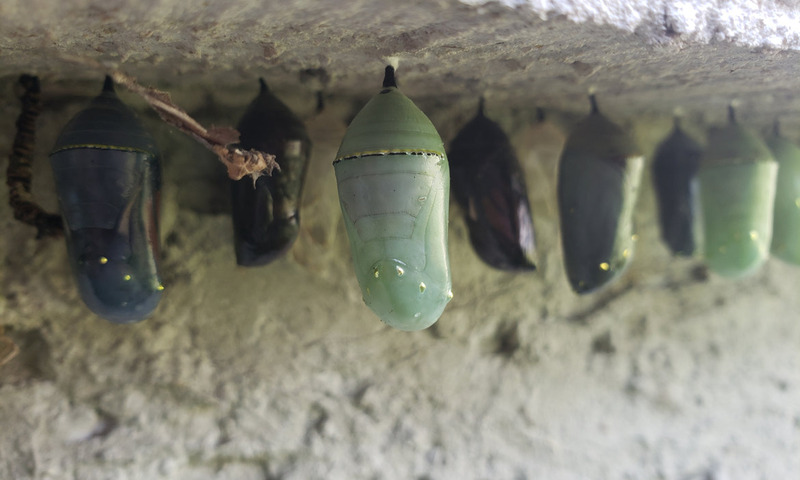 Under a ledge by the shed and hanging on branches and doorframes are hundreds of chrysalises in various stages of green to black, many on the cusp of releasing the butterfly to be. It’s a magical place, really. Flowers flank a long laneway leading up to a gorgeous stucco home with gardens, rooting pigs, a stinky goat and beef cows wandering a lush pasture beside the old bank barn. Ivan and his partner, Karen, are retired engineers and when they moved back to this area, they had a dream of being self-sustainable with an organic mindset. There is limited use of sprays and hours spent in the soil. They try to live and eat with a 100-yard diet. Ivan’s gardens are filled with produce, both conventional and experimental including a patch of sorghum and fodder beets called mangel wurzel. Historically, this property was known to Monarchs and they came yearly to roost. However, numbers had dwindled in the late 1900s and by 2010, the roost had disappeared. This bothered Ivan so he decided to plant a pollinator patch – half milkweed, half flowering annuals (Mexican sunflower and zinnias work best, he says) – to see if he could bring the Monarchs back. Now Ivan works with researchers at the University of Guelph to study Monarch habits and population. Mostly, he is busy cultivating space for the migratory insects to thrive. It’s funny, really, because as a cash crop farmer, Ivan remembers hating milkweed. “We launched an all-out attack on it,” he remembers. Now, he believes the primary chemical he once used in his arsenal – RoundUp – is largely responsible for the decline in the Monarch population. “What RoundUp does is kill the milkweed seedlings and that’s what the Monarchs really prefer,” explains Ivan. Milkweeds regenerate two ways: by seed and by rhizomes. The plants that emerge from rhizomes are tougher and less nutrient-rich than the plants that start from seeds. “Monarchs don’t like to lay their eggs on these less nutritious milkweed plants and the caterpillars that do have to feed on these plants are less likely to survive,” explains Ivan. Seedling milkweed is preferred yet these are the plants easily killed by pre-emergence sprays. So Ivan decided to plant milkweed and provide the butterflies with those tasty, nutritious milkweed plants the Monarchs crave. The process begins with working up the soil and planting milkweed seeds in rows. He uses seeds he has collected from the year before (from second year plants allowed to live for seed production at the insectory beside the river), bagging the seeds, and throwing them into a snowdrift to stimulate the stratification process milkweed seeds require to germinate. The milkweed seedlings are cared for like any garden plant...weeds are hoed and picked out to encourage a healthy crop of milkweeds. He plants two kinds: Asclepias syriaca (common milkweed) and Asclepias incarnata (swamp milkweed). The other half of the pollinator patch is densely planted with zinnias and Mexican sunflowers. Other flower options the Monarchs will feed on include Echinacea purpurea (purple coneflowers), gloriosa daisy, goldenrod, Joe Pye weed, New England asters, purple asters and other native wildflowers. However, for the pollinator patches around the house, he and the Monarchs prefer zinnias and Mexican sunflowers even if the latter sometimes flop over because of their height. After frost, once the butterflies have gone, Ivan collects the seeds from the flowers. Interestingly, he still depends on RoundUp to manage the milkweed in these pollinator patches. He mows down the plant in the fall and sprays the milkweed with RoundUp in the early spring as a pre plant burndown. A rototiller takes care of tillage and all these techniques prevent growth from the overwintered rhizomes. Besides the butterflies, the pollinator patches attract swallowtail butterflies, painted lady butterflies, bees and finches. The place is ALIVE with birds and insects, swooping and dancing among the tropical flowers. The McIlroys are at a stage of life where profit from every acre isn’t as critical as for a younger couple with a huge debt load. He understands why some landowners need to cultivate all acreage they own. That’s why he encourages pollinator patches as a practical first step to encourage Monarchs. Families won’t regret it. The learning that accompanies watching the process of butterfly to caterpillar to chrysalis to new butterfly is homeschooling with no effort. The contribution to the ecology of the planet is a societal perogative. Moreover, the sheer joy of having thousands of butterflies feed, fly and roost on your property is immeasurable. When he walks the patches with guests, he likes to tell them about the unique and amazing phenomenon of Monarch migration. Unlike other butterflies that can overwinter as larvae, pupae or even as adults, Monarchs cannot survive the cold winters of northern climates. Using environmental clues (such as a northern wind) they know when it is time to travel south. Using air currents and thermals, they can travel over 80 kilometres a day, some flying as far as 4,000 kilometres to reach their winter home in the oyamel fir trees of Michoacan and Mexico states in Mexico. Recently, Karen’s sister came to visit and having witnessed the spectacle of the Monarch roost at the McIlroy home in Ontario, she was converted by sheer joy to create her own pollinator patch.